The crag can be clearly seen from the end of the Tukino ski field road. 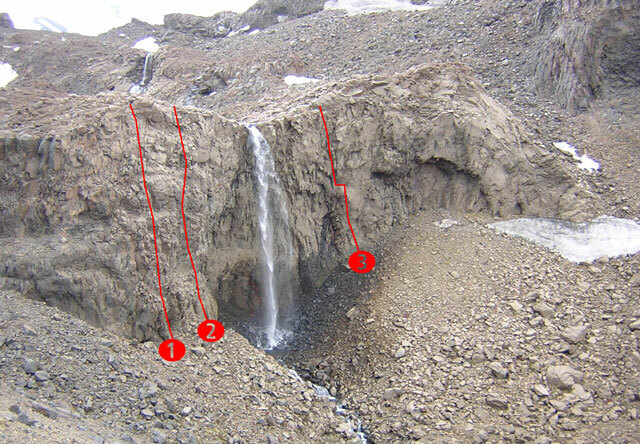 The routes are to each side of the waterfall, described left to right. Natural pro. Led on sight. On the right hand side of the crag. Climb a small pillar to the right of the large cave, a delicate step right, then up the wall which eventually eases back to easy slabs and a double bolt anchor placed well back. Climb the arete right of 'The Interview' from the bottom to the top, keeping to the arete as much as possible. An excellent route to learn leading on trad.